When it comes to maintaining all your grounds and gardens, Ricky Tyler Landscapes offers a gold-standard service. With 15 years’ experience behind us, we have a grounds maintenance and garden maintenance team in the Brentwood area to help you keep all your commercial and domestic properties looking in great shape. Businesses in towns such as Brentwood, Ingatestone and Shenfield value Ricky Tyler Landscapes for the good value we offer, not just in advice but also in reliable ongoing service. To ensure your premises are in pristine condition we can offer a range of services from grounds maintenance and commercial landscaping to lawn care and turfing. And because of the extent of our experience, no job is too complicated or too small. Rest assured, Ricky Tyler Landscapes takes security checking of all our operatives seriously and many of our clients are schools and other sensitive organisations where peace of mind is paramount. Our staff are smartly presented and bring top of the range equipment, meaning you do not need to invest in expensive lawn mowers and hedge trimmers yourself. We are able to offer you a flexible range of packages, from a weekly or fortnightly visit to a more seasonal approach in order to address particular issues. A discussion about your needs with our team is all it takes to get Ricky Tyler Landscapes keeping your premises at the standard to which you aspire. We guarantee you will be delighted with the way they look. 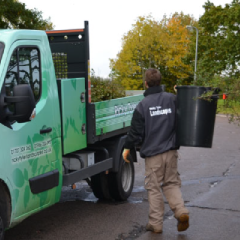 We remove all garden waste from your property before we leave. Being eco-friendly, we then have it recycled and composted, if possible. If you're in the Brentwood area, or further afield in Shenfield, Pilgrims Hatch and Ingatestone, give us a call to find out how we can help. 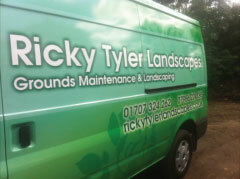 Ricky Tyler Landscapes can provide gardening and grounds maintenance services including Brentwood Grounds Maintenance covering Brentwood, Essex .